Before you click off this post because it sounds a bit like a boring health and safety announcement, please don’t! 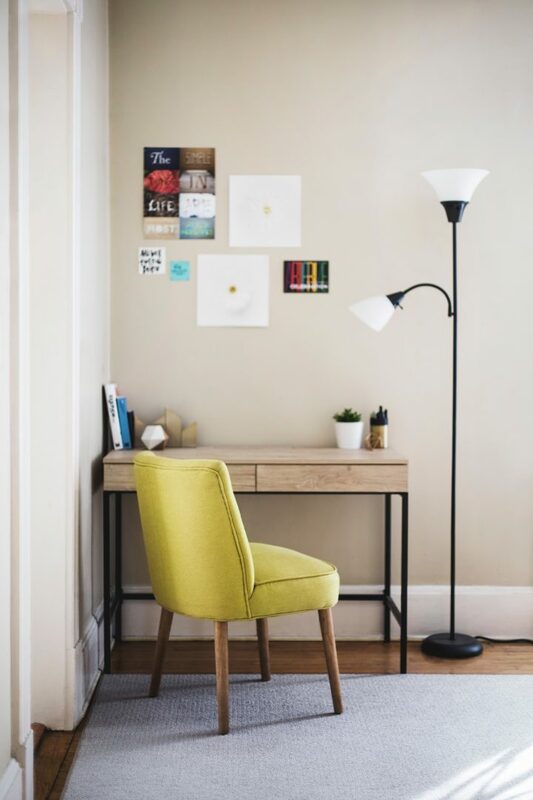 It might be a bit dull, but honestly, for anyone working from home at a desk shoved in a corner of their dining room, living room, or at the kitchen table, please take a moment to read through some of the tips I’ve found to make sure you don’t end up with a bad back, aching neck, or worse! Having an adjustable chair at the right height is one of the most important things. You need to have your feet flat on the floor and your eyes should be level with the top of your screen. If you’re too high you’ll get neck ache from looking down all the time and too low and your shoulders will ache at the end of the day. Don’t eat at your desk! Okay, I’m guilty of this one too, more than I would care to admit, and because of that my keyboard gets gross. Like, super gross. It’s definitely better to get away and have lunch somewhere else if you can. If you can’t, it’s really important to clear out those crumbs and give your keyboard a wipe clean! Make sure you position your desk so you have enough light to see but don’t have sunlight shining directly on your screen. No one enjoys a migraine! If you need a desk lamp, get one! There are things worth scrimping on, but I really think home office necessities aren’t one of them. Working from home means it’s tempting to buy the cheapest or not set up the same way you would if you went out to work. But remember, you’re at the desk for a number of hours at a time and your health is important too. Have you ever read those health and fitness mags where they tell you off for sitting all day and suggest weird, random stretches to do at work? We never do though, do we? Mainly because we don’t want to look like an absolute lunatic in the office standing up and lunging, or getting down on all fours doing cat-cow pose from yoga! But the benefit of working from home is you bloody well can stretch if you want to! There’s loads of advice on the internet about what stretches to do and as I’m not a yoga teacher I’m not going to suggest any specific ones. I have some that work for me, but why not have a look yourself. If you’ve made it all the way to the end then thank you! I hope you found it useful. Do any of you guys work from home? Have you got any go-to ways to release tense muscles at the end of the day? Leave me a message in the comments below and let me know! Literary gifts for the writer (or reader) in your life!